I thought it might be fun to have a little contest from time to time to see how well you know Snake Valley. I'll show a picture and if you know where it is, have memories of visiting it, or know some facts about it, please add them in the comments. 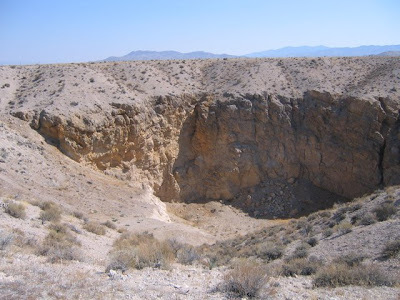 This huge sinkhole was caused by the collapse of an underlying limestone cavern. It's about 150 feet deep and 210 feet across at the top. It probably formed during the Pleistocene. Here's a hint for the location: It's located about 650 feet east of the Lake Bonneville shoreline and about 14 feet above it. 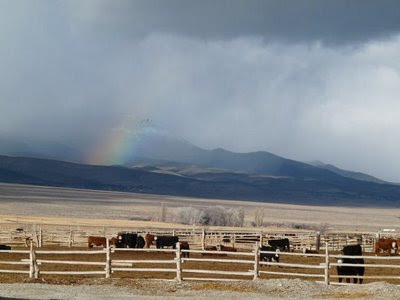 February through April is the main calving period in Snake Valley, and I've had the opportunity to visit some of the new calves recently. 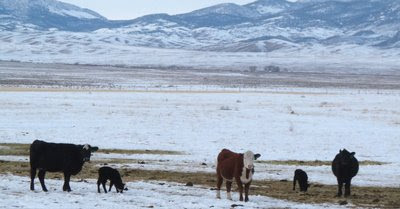 The main types of range cows in Snake Valley are hereford (above), black angus, red angus, black baldy (a mix of black angus and hereford), simmental, and Charolais. There is also a dairy in Snake Valley, at EskDale, which has Holsteins. In addition to producing milk, they sell bulls and embryos. You can learn more at the EskDale Dairy website. Here we've got black baldy on the left, hereford, and black angus on the right. 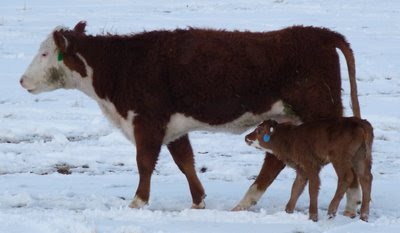 The calves arrive at about the same time due to artificial insemination. 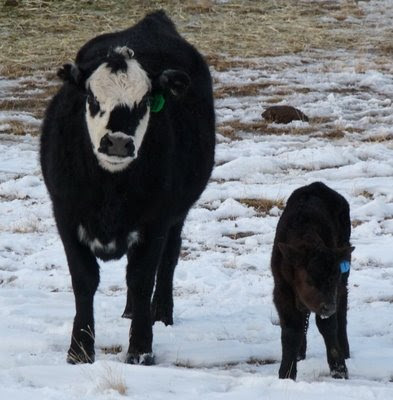 When the calves are born, they weigh about 50-80 pounds. Within ten or eleven months, they weigh about 800 pounds. That's some weight gain! 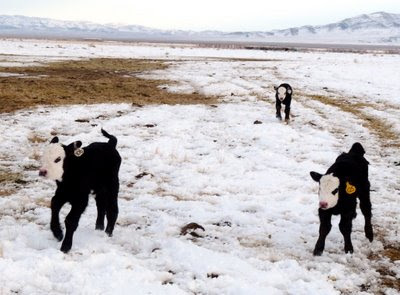 The young calves often appear playful, chasing each other and exploring the area. They usually don't get too far from the mama cows, though. One mama cow might be designated as the babysitter while the others go for water or a rest. Even though it looks like the calves are playful, it's never a good idea to approach one because the mama cow will take it as a threat and might charge. Some modern amenities have been slow coming to the desert. When Kathy and I moved to the West Desert, in 1972, we lived in Pleasant Valley. Utility-generated electricity had been introduced a few years prior but we had no telephone service. Mail was delivered twice a week. TV reception was hopeless and satellite TV was science fiction. We were about 90 miles from the nearest store. In 1980, we moved onto an old homestead in Partoun. We still did not have telephone service, TV reception (via Radio Shack's best antenna atop a high pole) was barely recognizable, and the main road in front of our house had a high clay content -- on rainy days we had to push vehicles for up to a half mile on a couple stretches of road. While we were building our adobe home, we had a privy in the corner of a windbreak. Stores were still about 90 miles away and we had almost 50 miles of gravel road in any of three directions before we hit paved roads. We now have telephone service, mail delivery three days a week, satellite TV, and DSL internet. All roads in Partoun are graveled and well maintained. These conveniences have made desert living much more comfortable. But throughout most of my life on the desert, we lacked one very critical service. Partoun had no fire department. A fatal house fire in January 1997, however, stirred Earl Lewis, father of four, to spearhead efforts to establish a fire department in Partoun. Other key people throughout north Snake Valley joined the effort, notably Keith Allred and Don Anderson. Now we are very fortunate to have fire departments in Partoun, Granite Ranch, and Callao. In future posts on this blog we plan to cover the history and personnel of these fire departments in more detail. It is a story of grit, determination, and perseverance. 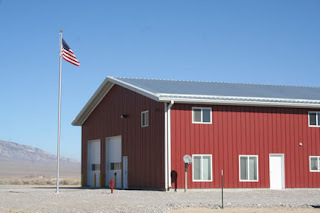 This summer, work was completed on a two-bay fire department building with training room and office -- its yard light has become the main Partoun nighttime landmark. Another fire-department light also has become a Partoun fixture. Each year the local fire chief, Earl Lewis, takes one of the fire trucks for a spin around the area. With emergency lights flashing, he stops at each home and delivers goodies. This year each family received a fire extinguisher, a carbon monoxide alarm, three smoke alarms, and some informative pamphlets on fire prevention. This short, colorful journey with its small, but useful, tokens is an annual reminder not only to keep our homes safe but that our neighbors have gone far out of their ways to be profoundly helpful. 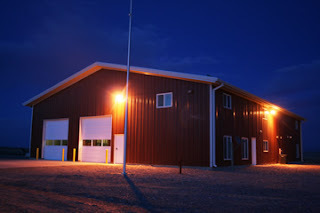 The fire truck lights and the bright yard light of the new fire department building are testaments to the kind of dedicated, unselfish neighbors living in Partoun. They exemplify the can-do attitude that has been a hallmark of Snake Valley residents for many decades past and will continue into the future. A few years ago I attended a week-long workshop and shared a motel room with a fellow from Orderville, Utah. He told me as soon as the town he lives in installs more than one stoplight he moves to a smaller town. Too much progress. I suspect it will be a long time before Partoun or any other Snake Valley town gets even one stoplight. But now we have fire department lights -- that represents real progress. Although we've had a really dry winter so far, we have had a few clouds roll in recently with a hint of moisture. It's amazing how much a couple mountain ranges can make a difference. The National Weather Service bases its water supply outlook on records from Ely. Ely has gotten quite a bit more snow than Snake Valley this winter--today they woke up with four inches of new fluff while we had none! Perhaps we'll get lucky with some of the next storms. The NRCS does their first snow survey up the Baker Creek watershed the beginning of March, and then we'll have a better snow estimate for Snake Valley.